Despite the results all going one way, Netball Samoa and the visiting Aute Pasifika are both taking positives out of the latter’s tour of Samoa. The Sydney-based team of Samoans brought U14, U16 and Open sides to Upolu and Savai’i this week, and all three teams went undefeated over local opposition. 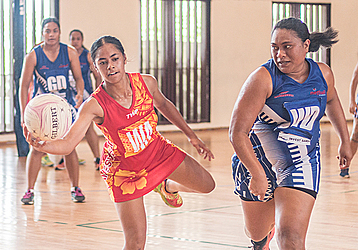 But Netball Samoa chief executive Officer Rosemarie Esera said the local players can take a lot out of the experience. “Not only the individual players but the Oriana Netball Academies generally, areas we can develop our skills and work on. Esera said an obvious point of difference between the Samoan and Australian players was fitness. “Once you’re fit, you can do anything. Flo Palamo was the manager of Aute Pasifika’s U16 side for the tour. She concurred, and said the locals have a lot of talent. “Even our girls say that, these girls are really good. Palamo said with the same training as the Aute Pasifika girls, the local players would be in the same position. She said it was good for the Sydney girls to see how fortunate they are that they live overseas, and have more opportunities. “We’ve had a great time and it’s really good to see Samoa getting into netball. Aute Pasifika have promised to return to Samoa, and have pledged fundraising support for netball in the country. Rosemarie Esera said this tour has opened up a lot of doors for Netball Samoa. “Aute Pasifika want to have an annual tournament, and also there’s another academy in Melbourne looking to come over.